Just thought that you would want to know that the next copy of American Currents is at the associate editor's desks! That means that you should be seeing a copy in your mailbox in about a month. I've included below a copy of the cover of the next issue, and my "Letter from the Editor" to whet your appetite a bit. If you haven't yet joined NANFA, there may still be time to join and get the next issue. For details about joining NANFA, please see http://www.nanfa.org/join.shtml. For questions about joining, please contact Tom Watson, NANFA's Membership Coordinator. His email is: onefish2fish@comcast.net. Anyways, here's the cover and my introductory letter. Enjoy! By the time you read this, summer will be all but gone and fall will be soon upon us. Here in Wisconsin, we had one of the hottest summers on record. By the sounds of it, most of the country shared in our fate as well. At least now, most of us can collect fish without frying in our waders! As you have probably noticed, this issue of American Currents is the issue of MORE! We’re bringing you 12 more pages of content, which includes two more pages of full color! And oh, what content we’ve got! Firstly, we bring you the second half of Brian Skidmore’s article, “2009 Convention Recap” (p. 2). We’re also bringing you part two of Peter Unmack’s series of convention teasers, “2010 Convention Teaser: Part 2, North Beyond Las Vegas” (p. 6). You will find a 2010 convention flyer on page nine. For the first installment of new content this issue, Phil Cochran brings us, “Fictional Accounts of Predation on Lampreys” (p. 10). Our feature article this month, “AquaCam Snorkel Camp 2009: Part 1,” (p. 12) is brought to us by a regular contributor of content to this publication, Casper Cox. Thanks, Casper, for all of the great content! Please don’t forget to see Casper’s photo storyboards related to his article on pages 21 and 22. Also new this month, we bring you the “Introduction to the Third Edition of the Florida Collecting Guide” by Charlie Nunziata (p. 16). The Collecting Guide was put together by a bunch of NANFA members and is really a great body of work! Even if you don’t make it down to Florida to do any collecting, this publication is a must-have for your library. It’s really great, and available at a reduced cost this issue! On page 20 starts our four-page spread of color plates. We have photos of springfish, some pictures of the cover and content from the Florida Collecting Guide, two pages of AquaCam Snorkel Camp pictures, and a subsequent page of killifish photos. Thanks to our printer for giving us more color for no more cost! 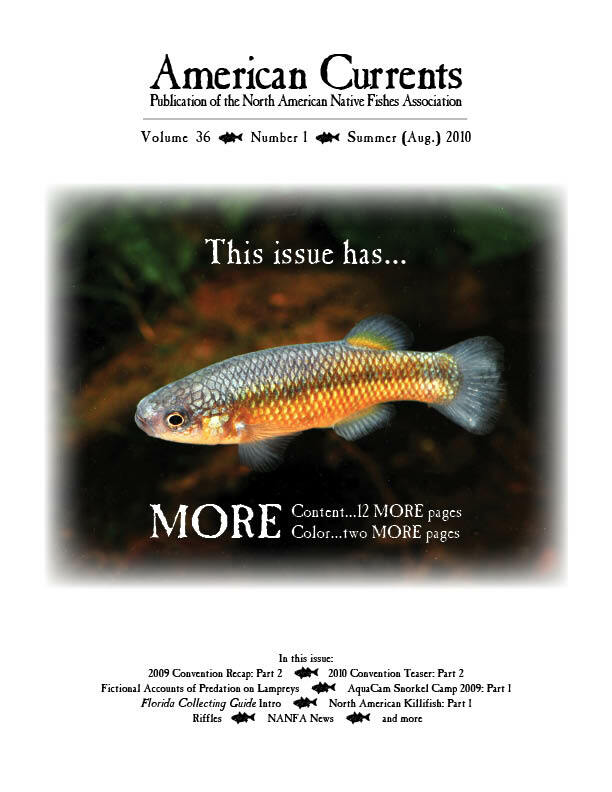 As if that weren’t even enough, Charlie Nunziata brings us the first article in his series about North American killifish, “North American Killifish: Part 1, Lucania goodei Jordan 1880, A Summary Review” (p. 25). Also, former AC editor Chris Scharpf brings us an addenda and errata section to his “Annotated Checklist of North American Freshwater Fishes, Including Subspecies and Undescribed Forms” (p. 40). As usual, we have our “Riffles” section (p. 34) with info about new and recent publications. Following that, our “NANFA News” section (p. 38) tells about some NANFA grant awardees and congratulates NANFA member Brian Zimmerman on the completion of his Master’s thesis. It sounds like it was a really neat body of work! Whew! Just writing about all of this content has made my fingers tired! I hope you really enjoy this issue of MORE! Awesome Brian! Thanks for this. Can't wait for it to hit my mailbox! of endless hours of editing the copy for us to read.